Signatory Roll of Distinguished Philatelists, RDP. Fellow, Life Member& Past President FRPSNZ. 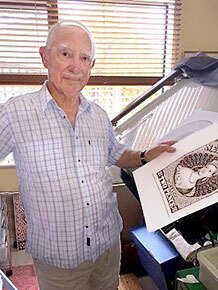 Patron of the Postal History Society of NZ. Currently carrying out research on all Postal Matters relating to New Zealand pre 1874, and Royal Navy Concession Rate letters 1795 to 1911, World wide, with emphasis on the Australasian Region. Author of major NZ publications on Postal History etc. Chartered Member Royal Institute of British Architects. Happily married, residence on Waiheke Island, situated in the Hauraki Gulf - 35 minutes by Ferry to Auckland.